I have been holidaying at home for the last two weeks, in sunny Queensland. 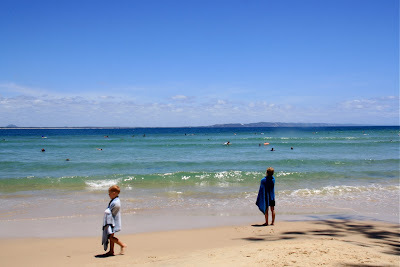 Today is Australia Day, so we headed to Little Cove at Noosa for an early morning swim (compulsory Australia Day activity). Other Australia Day must-dos include drinking beer, putting Australian flag tattoos on your face, having a BBQ with sausages in bread with tomato sauce, and apparently, thong throwing. The kind you wear on your feet, that is.